Your ostrich doesn’t know if you’re keeping him for his pleasing personality and interesting countenance or whether you intend to store him in the freezer later to feed your family. That distinction, though, will play a role in your care; some veterinarian products like antibiotics aren’t approved for animals raised for food or need time to dissipate from the bird’s system. A member of the ratites group, your ostrich doesn't need any more from you than most animals and typically requires less veterinarian care. If your ostrich could communicate in human terms, he’d laugh at the sticking-his-head-in-the-sand parable attributed to him and his kin. What he can stick his head in, though, is a fence, thereby risking injury and possibly his life. Make sure your fencing doesn’t contain holes or gaps larger than 2 inches by 4 inches. It should be at least 5 feet high -- 6 feet is ideal -- with no gaps underneath it for predator access. Burying the bottom a few inches in the dirt provides extra security. Give him at least 5,000 square feet if he lives alone, which is roughly one-eighth of an acre. If you have two birds, a quarter acre is the minimum. 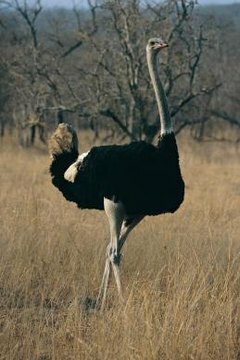 For an African transplant, your ostrich adapts remarkably well. He has much in common with many human vacationers, as he’d prefer to be where the temperatures are warm and there’s plenty of sand, but the tens of thousands of ostriches dwelling throughout the United States now demonstrate his ability to acclimatize. He doesn’t need anything fancy; a three-sided shelter that gives him protection from cold, rain, wind and snow will suffice. Make it at least 12 feet by 12 feet. If you do have an enclosed shelter, the door should be at least 6 feet wide. The advantage to having him enclosed, in addition to better weather protection, is that he’s also more completely protected from nighttime predators. Don’t stand and stare at your ostrich while he’s eating; he can actually attack you if you are too close, even if he likes you during non-feeding times. Check your local feed stores for ostrich pellets; given the birds’ popularity, the store may already carry it and if not, can order it for you. This is your best way of assuring he gets a balanced diet. If he has the opportunity, he’ll graze in his living quarters and may even pick up a rodent or two, as well as insects. Many owners feed alfalfa and wheat. Your feeding strategy depends on your bird’s future; if he’s a pet, what you feed him isn’t as much of a concern as if he’s destined for dinner -- in which case you’ll want to keep him and his meat lean. It takes 36 hours for your ostrich to digest his food, as it has to pass through three stomachs. Because he has no teeth, he’ll use pebbles to grind his food, so make sure there’s a supply in his pen or pasture. He can go long periods without water but have a continuous supply available. Check it frequently for cleanliness; if he can, he’s likely to bathe in it. Unless you can run faster than 40 miles per hour, don’t put yourself in a position where you need to outrun your ostrich -- he can’t fly, but he can cover a lot of ground. Pay attention to warning signs: If he’s flapping his wings or hissing at you, he’s upset at something and may take it out on you. Remember, too, that ostriches don’t kick backwards like a horse; they kick forward and sometimes to the side. You won’t need to worry about vaccinating your ostrich unless there’s an outbreak of something in your area that could threaten his health, so talk to your veterinarian. If you do need to administer vaccines or tend to an injury, you’ll be doing you and your vet a favor if you have a small pen in which to work -- about 40 feet by 40 feet. Remember also that he is attracted to shiny things, so watch out for pecks if you are handling him and wearing jewelry. American Ostrich Association: Fact or Fiction? What Deserts do Llamas Live In?